The 2014 Boston Marathon will be an emotional race for viewers as well as runners. It has been a year since terror bombings struck the race on April 15, 2013. This year’s race will be run April 21. In time for the granddaddy of U.S. marathons, Universal Sports Network has announced a free preview that will include this year’s race. The Boston Marathon, the world’s oldest annual marathon, ranks as one of the world’s best-known road racing events. Last year, more than 26,000 runners signed up for the race, which is 26 miles and 385 yards long. More than 23,000 started it. 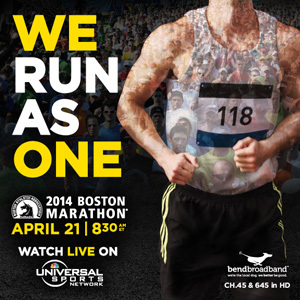 This year, Universal Sports Network will provide wall-to-wall coverage of the 118th running of the Boston Marathon. Universal, normally a part of the Variety and Sports tiers on BendBroadband’s channel lineup, has announced a free preview April 13-23. Come race day, coverage of the Boston Marathon will kick off at 5:30 a.m. PST on channel 45 and 645 in HD. The Boston Marathon Preview show will start at 4 a.m. PST. The Boston Marathon has been around since 1897. It is one of six World Marathon Majors; the others are those held in Tokyo, London, Berlin, Chicago and New York City. Lelisa Desisa of Ethiopia was last year’s male winner with a time of 2:10:22. The female winner was Rita Jeptoo of Kenya, who ran the race in 2:26:25. The men’s record on the track is 2:03:02, set in 2011 by Geoffrey Mutai of Kenya. About 5,600 runners were on the track when the bombs went off last year. Some 1,400 of them were just about a mile shy of the finish line at Boylston Street. Last May, the Boston Athletic Association announced that runners who had completed at least half of the 2013 race but did not finish because of the bombings were eligible for an invitation to this year’s race.